Every Georgia homeowner is going to have to deal with a slow or clogged drain at some point or another. It is a common problem that happens to nearly all homeowners at least once if not multiple times—one day the drain is working fine and then the next it is draining mysteriously slowly if it is draining at all. Sometimes a little bit of store-bought drain cleaner will fix the problem, but all too often, these drain cleaners only create a small hole for water to pass through without actually fixing the problem and clearing the clog. Homeowners have two choices: continually wasting their money on bottle after bottle of drain cleaner that does not work or calling in the professionals to get the job done right the first time. We are the Atlanta Metro area drain cleaning specialists. Any items that can get lodged in a drain and any substances that can build up in drains can cause clogs, though some things are more likely to cause clogs than others. Here are four of the most common culprits. Hair: Long hairs that escape down bathtub and sink drains can very easily get tangled and cause a huge knot, preventing water from moving through the pipes. Even short hairs can build up over time if enough of them are washed down the drain after activities such as shaving over the sink. Basic drain cleaner is usually useless against these types of clogs. Grease: Grease should never be poured down a kitchen drain, even if it is accompanied by hot water. 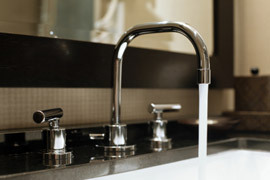 The hot water will not move all the grease through the pipes and eventually the grease residue will cool and solidify. The solidified grease will then be a sticky magnet for whatever else goes down the drain next, creating a blocked drain in no time. Paper Products: While toilet paper is usually not a problem for toilets to handle, items such as cigarettes, paper towels, baby wipes and feminine products should never be flushed. They do not break down easily, like toilet paper does, and they can very easily become stuck in pipes. Food: While garbage disposals are great for getting rid of some food wastes, they are not appropriate for all types of food. Foods such as rice and pasta should never go down the drain, as they can sit in the pipes and expand when water goes through, creating a blockage. Our professional drain cleaning experts have the drain cleaning equipment and expertise to clear clogged drains correctly. Depending on the location, cause and severity, the job could vary in terms of the solution, time and cost. Here are some tools and drain cleaning equipment that some companies may use. Power Auger: A power drain auger is a drain snake attached to a power tool like a drill. This type of snake is longer than the traditional hand snakes people buy at hardware stores. The power from the drill helps slowly turn the clog and catch it so it can be pulled out. Water Jets: Water jets or hydro jetting removes build-ups from pipes by shooting highly pressurized water through pipes to blast out any clogs. 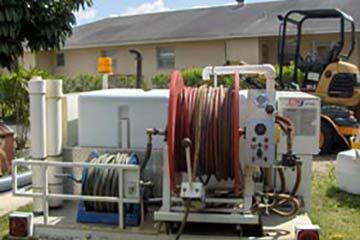 Water jets are effective on tree roots, mineral deposits and grease deposits. Rooters: Rooters are long motorized cutting devices for cutting roots from the old pipes they have grown into. While roots are not as common of a problem as they once were, they can still cause major blockages in older homes with weaker pipes that allow roots to break through. Industrial Vacuums: Industrial strength vacuum trucks remove the most stubborn of drain blockages by vacuuming and containerizing debris in both solid and liquid states. Industrial vacuums are more for commercial use such as for restaurants. Homeowners with serious clogs in their plumbing should not attempt to fix the clogs themselves. Drain cleaning expert have the knowledge and expertise to fix the clog. Remember, some of these drain cleaning tools can be dangerous to an inexperienced person. For this and many other reasons, just call PLUMBPROS Plumbing and let out solve the drain problems and give you the peace of mind knowing the job will be done right.